Rome of the West: Rev. William Barnaby Faherty, S.J. -- R.I.P. The Rev. 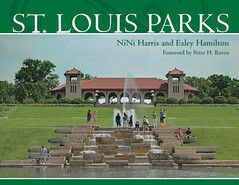 William Barnaby Faherty, a prolific author and noted St. Louis historian, died today at St. Louis University Hospital. He was 96 and had been in declining health, friends and family said. He taught history for many years at St. Louis University and wrote more than 40 books of history, fiction, essays and poetry. I am greatly honored to have worked with Father Faherty over the past several years, providing photos for some of his publications as well as assisting him with speaking engagements. Fr. Faherty was highly intelligent and had a prodigious memory, even in his later years. He was opinionated, as is expected of a college professor, but he was a gentleman, and I found him to be kind even under painful circumstances. Because of his long life, he had a view of history and of the Church which transcended the often simplistic opinions found in younger generations: he was simultaneously an ardent supporter and severe critic of many of the reforms promulgated since the Second Vatican Council. Fr. 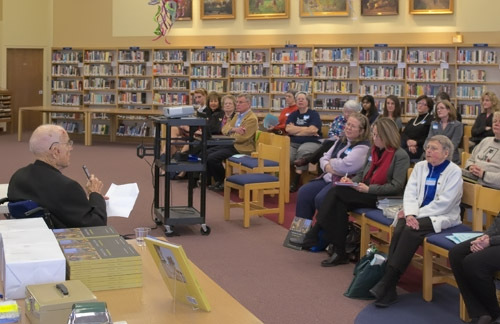 Faherty speaking before the Spring Conference of the Catholic Library Association, at the Visitation Academy library, in Town and Country, Missouri. March 13th, 2010. Fr. 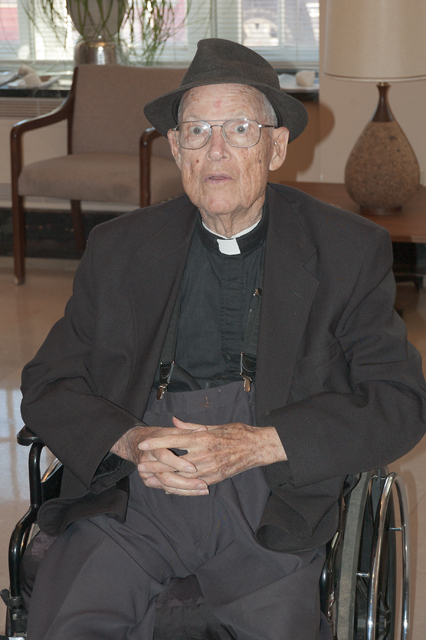 Faherty at Jesuit Hall, at Saint Louis University, on May 17th, 2009. We spent that afternoon driving around various historical sites in north Saint Louis County. 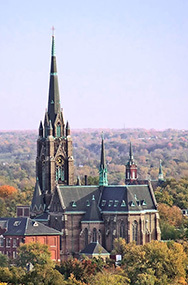 Father Faherty was the authority on regional ecclesiastical history, and knew many of the famous personages who made the Church in the United States what it is today. Some of his books can be found here at Amazon. I recall what Fr. Faherty told me about the religious life. He said that you will know that you have a true vocation if you find joy in it. People who are always miserable probably don't have the right vocation. He seemed to have found joy. 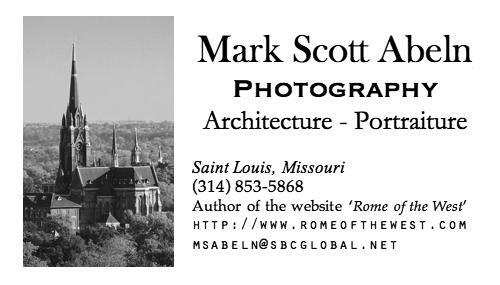 Click here for his obituary at the Saint Louis Review. Eternal rest grant unto him O Lord, and may perpetual light shine upon him. May he rest in peace. I've been out of touch but Fr. Faherty and my father worked together at the Queen's Work. My Dad called him "Barb". He often came to visit my parents in Springfield and at their farm in Halltown, MO. The photo of Fr. Faherty in his suspenders brought a smile to my face, I remember him always wearing suspenders. I wrote a bit about Fr. Faherty in this post from May 2008 -- A Wall for San Sebastian As It Relates to Pruitt-Igoe and Buying A Red-Haired Lady $26.00 Worth of Gasoline. My childhood memories are of him as the kind of person who, when you ask him what time it is, he tells you how to build a watch. Knowing Fr. Faherty and Fr. Clark and Fr. Lord among others, shaped me and my brothers and sisters. And for that I thank him.